What makes the Easterseals Rehabilitation Center so special? Thank you for tuning in to the all-local Telethon on WEHT Local! You helped us raise more than $1 million for life-changing therapy! Many friends and supporters of the Easterseals Rehabilitation Center want to make a lasting impression on the mission and vision of our organization. One of the simplest and most enduring ways is to include the Easterseals Rehabilitation Center in your will. 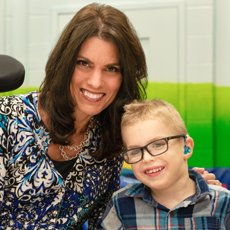 Your charitable bequest can help us continue crucial life-changing programs such as physical, speech and occupational therapies, therapeutic preschool, aquatic therapy, counseling, assistive technology, driver's training, adult day services, Milestones day care, and many others. A will is a legal document that specifies your wishes about how your possessions should be distributed after your death. Don't most people have a will? Statistics show that 8 out of 10 Americans die without a will. By not having a will, you are failing to exercise your right to distribute your estate the way you see fit. What will happen if I don't have a will? Your possessions will be distributed according to State law, without regard to your wishes or intentions. How can I make a charitable bequest? Fixed amount (the most common form) ­— A specific dollar amount is stated in the will. Percentage of the estate — The gift amount fluctuates as the size of the estate increases or decreases. Designated property — Real estate, stock or personal items can be given through a will. Residue of an estate — After all bequests are made to family members and friends, the remaining portion can be distributed to the charity of your choice. How can I make a charitable bequest if I already have a will? By adding a “codicil” or amendment. In most cases, it is as simple as adding “I give and bequeath to Easter Seals Rehabilitation Center the sum of $_______”.